Whenever I see a big-budget movie like Captain Marvel in theaters, I always try to see it in IMAX. The most obvious reason being that yeah, the screen is bigger and it usually takes over my entire field of view, which just makes it easier to get engaged in the film and enjoy it! But if I plan to leave the house for a movie these days, I’d prefer that movie offer some sort of experience or technology I can’t otherwise get at home. And more often than not, blockbuster movies have IMAX releases that are essential to the intended viewing experience or even directorial intent, but it’s a coin toss whether that footage makes it to home video, so I try not to chance it. Especially with internet streaming, so many movies are often cropped now to make it easier for the viewer, because on smaller-than-IMAX screens the jump between IMAX cameras and standard cameras in shots can be jarring to experience on say, an iPhone. So, in November of 2013, I drove out with my dad from Pendleton, Oregon to Boise, Idaho to see The Hunger Games: Catching Fire at the closest 70mm IMAX screen to me at the time, which was essential to experiencing the film’s whopping 50 consecutive minutes of IMAX footage, a filmmaking record that wouldn’t be beat until last year’s Avengers: Infinity War; the first film to be shot entirely with IMAX cameras. For the last 50 minutes of Catching Fire, the protagonist Katniss Everdeen played by Jennifer Lawrence is dreading the impending second Hunger Games she’s being forced to compete in. And at this point in the movie, the beautifully complicated and woefully timely themes of media, youth, celebrity, and economics the Hunger Games is all about goes out the window completely when (SPOILERS) Katniss’s confidant and friend Lenny Kravitz gets brutally murdered right in front of her moments before she competes in a fight to the death her government is forcing her to take part in. And director Francis Lawrence illustrates this turning point and new pressure on Katniss by composing one of my favorite shots of really, any blockbuster film. It’s at this moment the film transitions from its constrained, standard 2.35:1 aspect ratio to IMAX’s full signature 1.78:1 ratio, and sustains it for the rest of the film, gripping us to the action right from Katniss’ perspective. And it’s not a coincidence that this perspective and shot is wider, grander, and more engrossing than the rest of the film. The stakes and scope in the second Hunger Games are somehow larger, and this shot and choice subconsciously show us that, visually. It’s a really good movie, and you should rewatch The Hunger Games series sooner rather than later. But I have a strong memory of going to that film, standing in line with my dad. He couldn’t really understand why I said things like “I identify most with Katniss Everdeen” or “She’s my favorite character” when there are perfectly fine male characters to identify with, such as Peeta or Gale or Woody Harrelson, and I wasn’t really able to articulate at the time what I meant by those things beyond just being engrossed by the female lead. Regardless of the gender, as the protagonist, it’s essential that we care about Katniss and whether she dies in the Hunger Games or not. Otherwise, the film wouldn’t work. For the past few years now though, around when people realized Star Wars was going to highlight women and people of color, and that Ghostbusters would be gender-swapped for the changing times, there’s this super gross flurry of angry white guys on the internet who want nothing more than to see these films fail, and eliminate the possibility for tempered discourse or criticism of these important, ultimately progressive, blockbusters. Review aggregator Rotten Tomatoes even went so far as to eliminate their “want to see” feature because minority-led blockbusters are suspectable to fake review campaigns. Though, if you remove yourself from your own perspective for a moment, and check out the Top 100 Highest Grossing Films of All Time for example and look for films with female protagonists, you’ll see exactly why studios have made it a priority to reverse engineer their franchises into more inclusive, diverse, films that ultimately reflect the world we live in. Because it makes money, yes absolutely. But also because there are infinite worlds and stories left unexplored that can truly only come from people whose experiences and imaginations are different from the people who have made and financed Hollywood movies for the last 75 years or so. Which brings me to Captain Marvel. As a film, Captain Marvel carries a lot of narrative weight not just as an origin story, but as a franchise-launcher, a preamble of sorts to next month’s Avengers: Endgame, and as a quasi-Hollywood statement piece. There are a lot of moving parts that don’t always align, but one particular thing I admired was how it actually utilizes the technique in IMAX that I hadn’t seen since Catching Fire. The aspect ratio would ebb and flow fluidly at optimal times to make the widening of perspective as fluid as possible. Something the film itself often works overtime to do, just to make bold shots and images less jarring to a skeptical audience. From a marketing standpoint, touting Captain Marvel as the first Marvel Studios film led by a female superhero is immediately enticing for, like, at least half of its audience and the population. And, through her cult indie appeal and recent Academy Award, Brie Larson seems to be one of the best women and rising actresses to lead the charge on changing how blockbuster movies get made and who they’re made for. Which was all she was doing when she made the comments that made internet manbabies so angry! In case you have misogyny stuck in your ears, there’s a stark difference between saying white guys shouldn’t watch or review movies, than what Brie Larson’s saying here. The fact is, there are a disproportionate amount of white male film critics and therefore, white male perspectives usually dictate how movies are viewed critically. Like on Rotten Tomatoes. And, while media itself becomes more reflective of what the world actually looks like, a similar change must occur in film criticism too so that more minority filmmakers get their movies reviewed by minority film critics, dramatically increasing the likelihood of getting seen by mainstream audiences. You can get annoyed by whatever hokiness you’re still feeling about all the Oscars Black Panther won, but Disney makes up for 40% of the Box Office now. Disney is the mainstream and yes, they want to make the most money possible, but they’re recognizing that they set the precedent for the rest of Hollywood and even if you don’t care for the groundbreaking movies they’re making, that doesn’t make them not worth recognizing. So no, I don’t think it matters what white guys think of Captain Marvel. There’s plenty of time to pick apart the film while it does its groundbreaking. Like, if you’re thinking of writing a bad review of Captain Marvel before you’ve seen it, or you feel that ‘boycotting’ over ‘sexism against men’ is a valuable use of your time and Twitter characters, try instead widening your field of view and make your perspective IMAX sized. Because your boycott didn’t work, and they aren’t gonna work. Tyler Scruggs is a writer and musician living in Atlanta with his partner Mark. When he’s not churning out internet content, he’s paying too much for coffee and buying movie tickets weeks in advance. Feel free to validate him on Twitter (@TylerScruggs), Instagram (@Scruggernaut), and YouTube. Superheroes are meant to be rebooted. I decided to wait a bit on my Ant-Man review because I am in the unique privilege of not running a film-focused website, so I don't need to meet a deadline or rush it out opening weekend. So I don't. Which makes me happy! 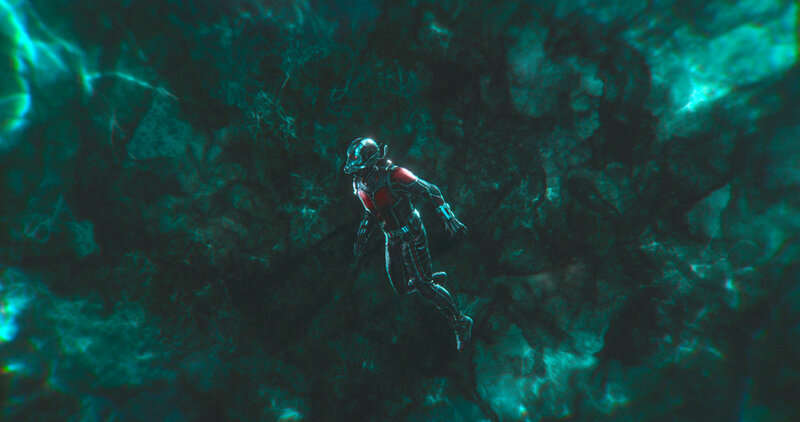 This makes this clickbait, you're here because you want to be stuck in the Quantum Realm with me and talk about Ant-Man, and that also makes me happy! It also means I get to be a little spoilery (but not yet!) and maybe a little more thoughtful, so I'm hoping to apply that freedom now to perhaps the most plain, by-the-numbers Marvel Studios movie in some time, and explain why. First, to those like me who idiotically keep meticulous track of how Disney Summer Sausages -- I mean Blockbusters are made, you know that the original Ant-Man was a bit of a hodgepodge. And if you don't, you may still have among an array of feelings on the film, but generally, the first Ant-Man film was well-received, a modest hit by Disney-Marvel standards, and an overall good time. Ant-Man (2015) blend of nine years (!!!) of pre-production visualization from action auteur Edgar Wright (Scott Pilgrim vs The World), quick revisions from comedy directors Adam McKay (Step Brothers), Peyton Reed (Yes Man, and the eventual director of both Ant-Man & Ant-Man and the Wasp), Paul Rudd, and Earth's largest entertainment company in the midst of building cinema's first extensive long-form storytelling structure through the highest-grossing franchise of all time. Something had to give (and we'll always be a little sad for it, Edgar), and what was left was a tonally bipolar but ultimately inventive, charming film that serviced the Marvel Cinematic Universe as a whole, but may be a weaker film for it. Now, with a more singular (or at least less chaotic) vision for this year's Ant-Man and The Wasp, did the stability help the film? Especially after the dour note Avengers: Infinity War left on? Well, sorta! Paul Rudd, Michael Douglas, Evangeline Lilly, and Michael Peña along with the entire X-Con gang return for the sequel. In fact, it seems as though everyone but the antagonist from the first film returns, and that's kinda different from most Marvel movies. Now that there are 20 of them (yes, 20), it's apparent some of them carry certain patterns, traits, and tropes. And even among continuations like Iron Man 2 and Guardians of the Galaxy Vol 2, Ant-Man and the Wasp is the most sequel-feeling of all the Marvel films. That's because it's very much 'more of the same, but better', unlike the drastic departures in tone and feel between the Captain America films and Thor sequels. Ant-Man and the Wasp decidedly, and perhaps tragically, is not balls-to-the-wall insane or inventive like Taika Waititi's Thor: Ragnarok. And had Marvel obtained its 2017 confidence when Ant-Man was in production, it would've likely produced a more memorable result in the process, with or without Wright at the helm. But even with the global dominance of Black Panther and Avengers: Infinity War, Marvel and director Peyton Reed chose to remain...small, instead focusing on the tone of 90s VHS Disney Family Chase Films™️like Honey, I Shrunk The Kids or Escape From Witch Mountain or even Tomorrowland. It's the kind of high-concept sci-fi that isn't entirely well-executed, but simply delectable to me because of the sheer inventiveness that can arise when creative people are given hundreds of millions of dollars to make crazy unbelievable things all the more believable. I call Ant-Man and the Wasp a mediocre Disney sci-fi film as a term of endearment; it's among great company like The Black Hole, Tron, hell even this year's A Wrinkle in Time had some great ideas even if they didn't quite make it to screen. Even in all its weird gross corporate-ness, Disney still is giving super creative minds the ability to manifest super creative ideas into existence. Ant-Man and the Wasp doesn't quite reach the wildly creative set-piece heights of Edgar Wright's contributions to the original film, but it's still a worthwhile family trip to the cinema, and those will always be in short supply. No one dies in Ant-Man and the Wasp. At least not before the first set of credits roll. Being that this takes place during the events of Infinity War, the first post-credit scene serves as a morbid cliffhanger, meant to catapult us into 2019's still-untitled Avengers 4. Obviously we're all first in line for it next year, but I can't help but feel a sense of time-wasted after watching the film. Yes, I knew something to this effect would take place. But, why work so hard to make an intentionally palate-cleansing fun film, only to virtually undo it by killing 3/4ths of the main cast, however temporarily? It's a minor quibble, and obviously somewhat necessary, but in terms of audience experience, I think that scene in particular did a mild disservice to the rest of the film. Perhaps teasing the looming nature of Thanos' Snap would've given the film and ending a better sense of satisfaction. It just doesn't sit right with me. Fandango- Ant-Man and the Wasp in Theaters Now! II wasn’t gonna talk about Spider-Man: Homecoming, really, because after fifteen years of watching superhero blockbusters, you begin to learn a little. You start to learn that the late-night high received from watching what was once merely played out via action figures and comic books and Lego-shaped dreams in your head was just realized on screen. It might just be high. You know that, yes, you can log onto Twitter dot com and hear a bunch of dudes in Texas “Well, actually” their way through dismantling all the things you thought were cool about the movie you just paid two Chipotle-burritos worth to see. And yes, this was probably a Frankenstein movie crafted first in a boardroom before any creative being laid hands on it. It can be so deflating to go online and feel the stark, harsh comedown of watching what you thought was a great movie, only to pick it apart afterward and critique it into Wal-Mart $5 DVD bin oblivion. All I’ve gotta say to that is WHATEVER, HOMECOMING WAS THE COOLEST SPIDER-MAN MOVIE SO FAR. In preparation for Homecoming, I rewatched a few Spidey films. The original movies mean quite a great deal to me, I was a child when they were released. Though, that didn’t stop my father from taking me to each of the midnight showings back when those existed. We’d go to the now-closed Century Theatre in west Tucson; the kinda-dingy one right off the freeway, notorious for carjackings and a lack of security that was prime for movie-hopping. Sam Raimi’s original Spider-Man trilogy will forever be “Capital-C” Cinema. The kind of Cinema that’s referenced into eternity. The sort of cinema that, when witnessed for the first time on a screen larger than life itself, evokes the feeling that you’re watching the newest thing that can exist at that moment in time; whether it’s 2002 or 2012. It’s the best thing Hollywood or anyone can produce at that moment, even when it’s not. Marc Webb’s The Amazing Spider-Man isn’t a perfect movie, but seeing those POV shots of Spidey running, leaping, and swinging through New York on a giant IMAX screen was a joy to watch. Hundreds of people came together to create this. It was people’s job too. I live in Atlanta, Georgia, where nearly every Marvel Studios movie has been produced since Captain America: Civil War. It’s where the most expensive movie production ever, Avengers: Infinity War and the untitled 4th film, is being shot only ten or so miles away. Though it’s very infrequent, Atlanta is mentioned or seen in much detail. Save for the beautiful ode to Atlanta Baby Driver. Watching these film in Atlanta, there’s a certain pride that takes place that wasn’t quite felt during my time in Los Angeles. During the credits we’re forced to sit through each Marvel movie in hopes for a teaser for future installments when the big Georgia Film peach logo appears, the whole theater erupts in applause. However, despite having scenes in New York and DC, remnants of Atlanta remained in Homecoming, and that makes me so happy. Whether it’s a recognizable street corner or simply Donald Glover’s presence, the film definitely felt Atlantan. Combined with that, for the first time, the New York City Peter Parker’s growing up in is the same one I’ve been living vicariously in every summer for nearly ten years now throughout the Marvel Cinematic Universe. In the cold open for Homecoming, the prologue that precedes the Marvel Studios logo and before we’re reintroduced to Peter Parker Post-Civil War, we meet Adrian Toomes, played by Michael Keaton in 2012, days after the events of the first Avengers film, who's been tasked with cleaning up the Chitauri mess left behind by The Avengers. Then, with all his financial eggs invested in the clean-up contract with the city, he’s undercut by Tony Stark’s federal Damage Control department. Though that doesn’t stop him from keeping some alien weaponry for himself, and thus the super-powered arms dealer Vulture is born. From there, I knew we were in for something special. Warmed up from his fight with (most of) the Avengers in Captain America: Civil War, high school sophomore Peter Parker (played brilliantly & charismatically by Tom Holland) is discontent with his life and eager to receive a call from Tony Stark. So much so to the point of quitting all of his previous passions and devoting all of his time to Spider-Man, even if that means screwing up more often than solving a crime. Meanwhile, Tony Stark’s mentorship is distant and restrictive, despite the clear patriarchal connection. And, the famous “With great power comes great responsibility” line is flipped on its head when great power mostly comes from great tech created in part by Stark’s genius. There’s likely going to be a common criticism about the sheer levity of it all. Spider-Man: Homecoming’s most prominent villain isn’t quite Shocker or even the Vulture; it’s the 5 Spider-Man films that preceded it. Ditching the origin story or indeed any of the pitfalls that may make you say “Spider-Man movie X did it better,” what we’re presented is essentially a build-off of what you’ve seen told so many times before. Pulling a 180 from the needlessly brooding Amazing Spider-Man, the laughs-per-minute in Homecoming is almost untenable. It’s a straight-up comedy, with nothing like the terrifying moments in Sam Raimi’s trilogy (Jeez, remember that terrifying “finish your prayer” scene between Aunt May and the Green Goblin?) to bog down the film’s central mission: to deliver the funniest, most charismatic Spider-Man the silver screen has ever seen. The hugely diverse cast is also definitely worth notice, too. Nearly every supporting classmate character in Homecoming is played by a person of color, there’s at least one openly gay role in the film, as well as most of Peter’s teachers. Never does it feel forced or unnatural. In fact, it’s the most natural-feeling cast of characters in a blockbuster in a long time; and that’s intentionally so. Spider-Man has always been the bridge between the everyman and the spectacular. Spider-Man: Homecoming feels like the most 2017 think you’ll see all year. Miraculously, everything about it feels current, timely, and fresh. I’m gonna mention Donald Glover again, not only because I’m so proud of him and everything he’s worked for over the years, but because of the pivotal role he played in Spider-Man as an icon. Back in 2010, when Spider-Man 4 was canceled, a reboot was looming, and Community was at the height of its cult popularity, there was a Twitter campaign started you may remember — #Donald4Spiderman. It actually grew quite large, and posed an important question: why does Peter Parker need to be white? Couldn’t he be played by anyone? Andrew Garfield was eventually cast, but the problem remained, and Marvel Comics took notice. Seemingly starting the trend of mindfully-diversifying our heroes, Brian Michael Bendis (creator of the Ultimate Spider-Man comic series — a parallel universe from the main comics) killed off Peter Parker and created Miles Morales; a half black, half Latino character inspired by Donald Glover. Miles is a 15-year-old poor kid from the Bronx who wins the lottery in two ways: he’s accepted into a prestigious science academy (the same we see Parker and co. attending in Homecoming) and, he’s bitten by a radioactive spider that may have crawled into the duffle bag of his villainous uncle. Aaron Davis, played by Glover, mentions his nephew in the film, condemning the Shocker’s powerful and deadly weapons as too dangerous. He clearly cares about his family — a huge theme in Homecoming — and I’d put money on the fact that we’ll probably begin to care about his nephew too when he’s introduced into the Marvel universe sooner rather than later. Marvel Studios films often face criticism that, because of the nature of the MCU, they feel flat and TV-like. Sometimes it’s in the way their shot, and other times because of the stakes that can sometimes fall short of threatening. Despite the comedic and lighter nature of the film, there are very distinctly dramatic and powerful scenes. It’s the Capital-C Cinema I was talking about earlier. Especially in the third act when Parker is put to the test by Michael Keaton’s terrific performance as Vulture. There’s a sense of devotion and power behind his character and his motivations, it’s palpable in Keaton’s famous micro-expressions. Motivated by family, Vulture ends up being one of the best villains the Marvel Cinematic Universe. Kevin Feige said recently that 2019’s untitled Avengers film will be the conclusion to the 22-film arc that the Marvel Cinematic Universe has been building towards, with the upcoming Spider-Man sequel taking place mere minutes after the events of the film. Tom Holland’s Peter Parker is acting as the cornerstone for the future of Marvel, and it seems like a safe bet. There’s really no telling what Marvel Studios has to offer for years to come, but the train isn’t stopping anytime soon, even when Robert Downey Jr, Chris Evans, and company are reaching their final destinations. Even with the sometimes episodic nature of the MCU and after the sixteenth entry in the series, it’s still capable of evoking Capital-C Cinematic moments akin to Spider-Man 2’s famous train scene. This time, however, literally anyone has the potential to be behind the mask and inspire a generation. Even you.